Visualization of data networks, social media, industry structure, people analysis and organizational structures and enormous translation data is now coming online to make sense of the data deluge and convey the results of analyses through emerging, open-source programs. Network analysis expands our core competencies such as cooperative organizational networks, brand narratives, pricing, strategic messaging, and workforce Monte Carlo projections. This kind of analysis can be applied to other mega datasets, consumer sales data from any major corporation, major supermarkets, huge human resources organizations like Pitney Bowes, Walmart, or the United States Navy, website visits, sales data or survey data. It is a great tool that, together with complementary analytic skills, we can deploy to give our clients a full picture of their product or organizational network. 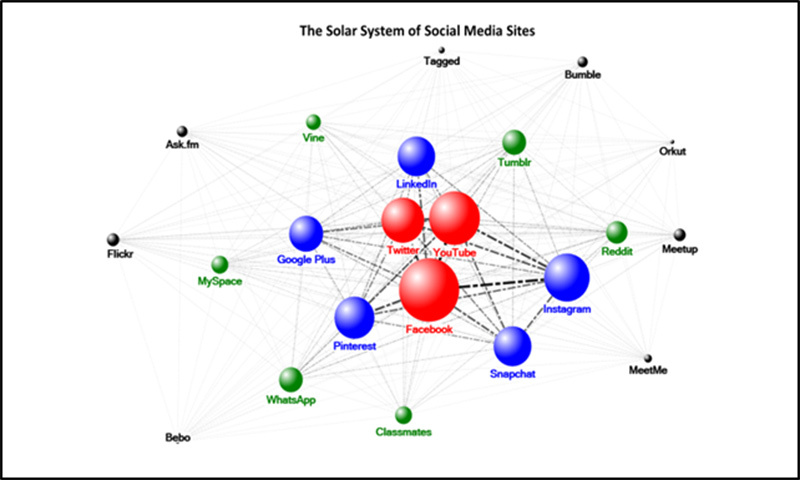 For example, if social media were a solar system, what would it look like? Would there be a sun, an earth, a moon? In a survey respondents were asked which Social Media sites they regularly used. With this data we were are able to map a network, with the size of the spheres representing market share and the thickness of the lines representing the relationships between spheres. The red spheres represent are our major players—the center of the social media universe. No surprise, Facebook is the Sun, YouTube is Jupiter, and Twitter is, say, Saturn. The blue spheres are Social Media sites with the second highest proportion of users; the second tier. Green spheres the third ring. The small planets in black are kind of like Mars, out there somewhere, existing but small. The ultimate utility of this map is that in one glance a client can grasp the social media solar system. Yes, MeetMe is small, but it a better connection to Instagram than to Google Plus. Great information. Ask.fm is an anonymous question and answer platform website used regularly by lots of young people in Ireland and around the world. Its strongest connection is to Facebook, which is the worldwide leader. Bebo describes itself as “a company that dreams up ideas for fun social apps;” Though not a central player, its strongest relationship is with Google Plus. This seems intuitive given that Google is the largest distributor of apps, and terrific information for the executives at Bebo. This kind of map can be applied to corporate human resource collaborative structures, Mexican drug cartels, email analysis, or even store-bought cold cuts.